This is a web version of the Contact article written by Mary Kidd, with photographs by Martin Rogers. 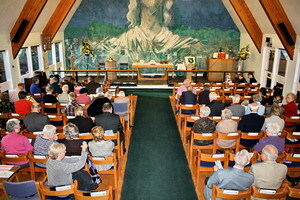 Ever since it was suggested that St. Margaret’s Church has a cause to celebrate this year – the 40th Anniversary of its founding in the Rosyth Naval Base – ideas and plans were mulled over, decisions made, and plans put into operation to see how best this might be done. 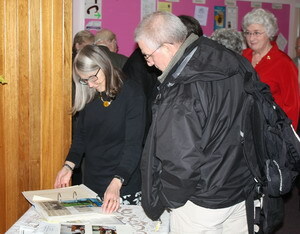 It meant a lot of planning, research, correspondence, phone calls, e-mailing, catering and so on. All the members of the vestry, the choir and the congregation had some part to play in it all, and this contributed to its success. It was felt most appropriate to choose for our ‘big day’ the Eve of St. Margaret, when we would have celebrated our Patronal Festival, and to share the occasion with the Methodist Church with whom we are in partnership, and worship ecumenically and regularly. 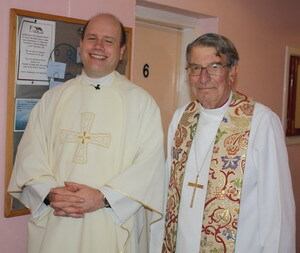 On the day itself we were honoured to have as our Preacher the Rt Revd Michael Henley who had twice been our Chaplain at St. Margaret’s, and former Chaplain of the Fleet. (His address and memoire are at this link). 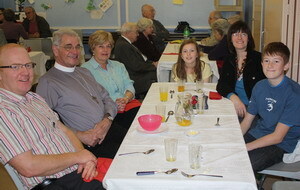 Also present in the congregation was the Revd Nigel Johnson, former Naval Chaplain and his wife, Barbara. During the 1970s Nigel composed a setting for the Artificer Apprenticeship Choir, and this was sung during the Communion service. The choir processing out, led by Jock Headden. The cross was dedicated to Maud Headden, Jock’s late sister-in-law. 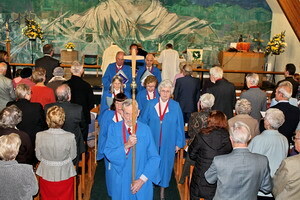 Former members of the Choir and Congregation were welcomed to the service; it was a joyous occasion and an excellent opportunity to share fond memories, and to express thanks for being a part of the life of St. Margaret’s Church. 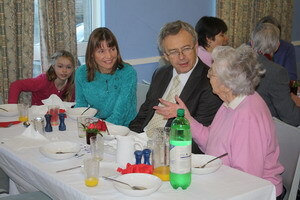 A celebratory lunch was shared after the service when friends were able to meet up with ‘old’ friends, some of whom had travelled a considerable distance to be a part of this day. 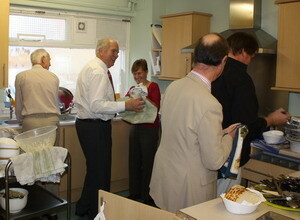 A happy group of Methodists well fed! 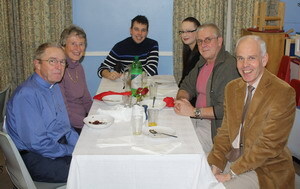 Many messages had been received from others who had not been able to be present – these were read out following the meal. As well as looking back, as a partnership we look forward to travelling further together. Eve Denning holding court! Alison Jones used to be a member of our choir.